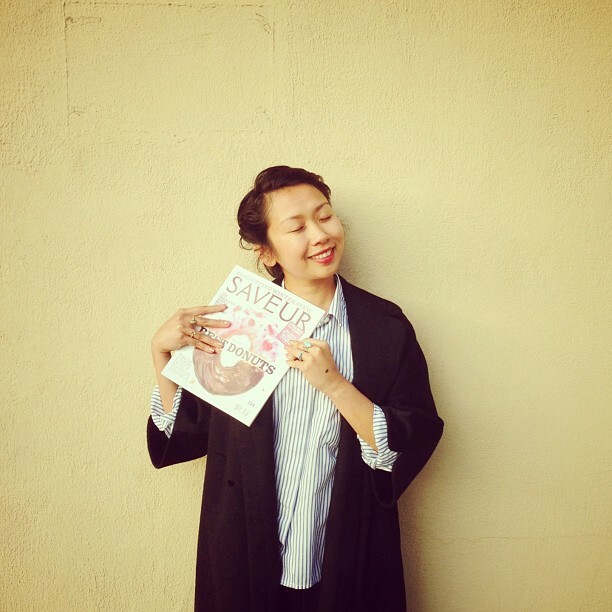 The latest Saveur Magazine is dedicated to DONUTS!! Today, before a delicious dinner at Camino I walked into a bookstore and nabbed this little gem. As a little girl I had fond memories of working beside my dad. Our family owned and operated a small donut shop called DONUT LAND. The completely enchanting memories, from the smells that still chase after me each time I pass by a bakery or donut shop. Images I often grab over and over again are the precious ones that I wish to never forget. As he frosted, sprinkled or fried donuts, or when he blended the batters in the industrial Hobart mixer, the tart and tangy smell of dough proofing, the times when popping that crusty proofing dough on the bakers table seemed so satisfying, akin to maybe the popping of wrapping material…or or or the comforting smell of Farmers Brothers Coffee. Of course during the summers I scooped ice cream, I like to think that this is the reason why I scoop a mean scoop. I love you dad. You are always with me, every time I sit down to eat, chop, bake or step foot inside a kitchen you are beside me.